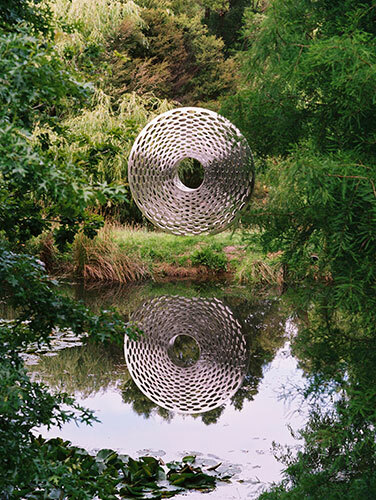 The circular artwork can be viewed as an archetypal symbol of time. The work references micro-organisms and man-made machinery; plough discs and wheels. The rotating base allows the work to pivot, revealing fragmented glimpses and reflections of the adjacent environment. Newmarket Arts Trust purchased Sliver in 2008 for installation at the corner of Khyber Pass and Broadway, where the work was integrated as part of the urban landscape. Dimensions: Diameter 3000mm x Depth 700mm tapering to 60mm. Materials: 3mm Marine Grade 316 Stainless Steel, hand finished and electropolished. Images: Mark Smith and Paul Hartigan.